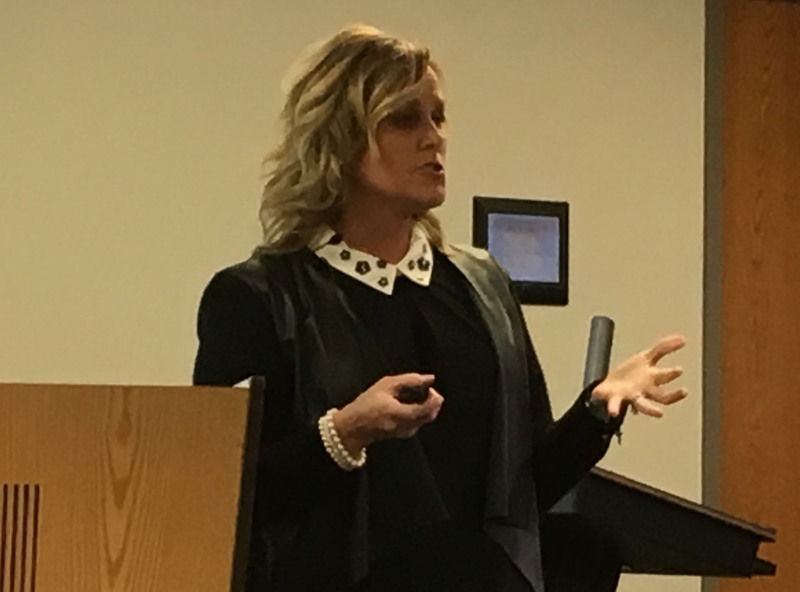 I don’t think Indiana Superintendent of Public Instruction Jennifer McCormick has ever been shy about saying what she thinks, but she seems to have become even more outspoken since announcing in October that she won’t seek re-election when her term expires in January 2021. She called out legislators on several issues Wednesday in a Bloomington discussion sponsored by the Indiana Coalition of Public Education-Monroe County and the Monroe County Community School Corp.
School funding: McCormick said the school funding increase in the budget that the Indiana House has approved – just over 2 percent each of the next two years – isn’t enough. Low pay and working conditions are creating a severe teacher shortage, she said, and more money is needed. Thirty-five percent of teachers leave the profession in their first five years. Little Rock Central High School in 1957? New Orleans Frantz Elementary School in 1960? Somewhere else in the South? No, the setting was Emerson High School in Gary, Indiana, and the year was 1947. 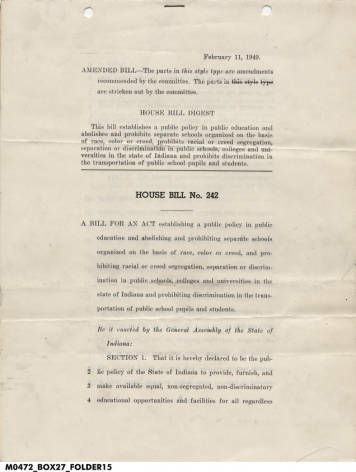 1949 Indiana school desegregation bill. (Indiana Historical Society). 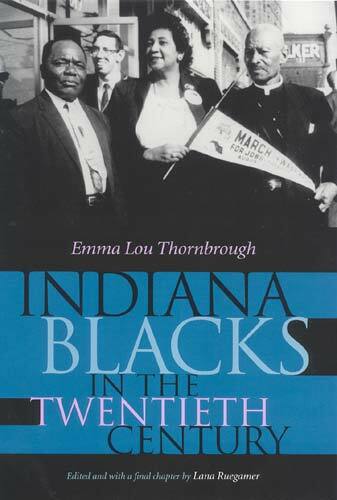 The description is from Emma Lou Thornbrough’s book “Indiana Blacks in the Twentieth Century,” which devotes an entire chapter to the rocky history of school desegregation in the state. Gary school officials had decided to desegregate after racial tensions, including a strike in which white students demanded the removal of black students who attended separate classes at Froebel High School. Schools in several of Indiana’s largest cities were formally segregated in the 1920s, the heyday of the Klan in the state. While Gary decided on its own to integrate, Indianapolis and Evansville continued to have racially segregated schools despite decades of objections from civil-rights advocates. Other cities, including Bloomington, had segregated elementary schools and integrated high schools. In 1949, Democrats took control of the governor’s office and the House, and the state legislature passed a law prohibiting racially segregated schools. But school districts were given several years to comply; and in many communities, housing patterns meant most whites and blacks attended different schools. Indiana Republican legislators dropped a surprise Monday. They are proposing to increase state funding for some students who receive state-funded vouchers to attend private schools. Currently, students who qualify by family income for free or reduced-price school lunches qualify for a voucher worth 90 percent of state per-pupil funding received by their local public school district.